The owners of The Butchers Club have broken away from the Hong Kong franchise, and revamped the joint with their own original concept: Philly Shack at Clarke Quay. On its FB, it claims to be the first restaurant to serve authentic Philadelphia cheesesteak or Philly cheesesteak in Singapore. Actually, there was a place at Kallang Mall which served Philly cheesesteak years ago, but it had closed down. The menu is lean with cheesesteaks, burgers, wings, and sides. There are only two choices of cheesesteak: Philly ($15) with sliced ribeye, caramelized onions, and cheese or Fully Loaded ($18) which is a Philly with green peppers, mushrooms, and jalapenos. In any case, the Philly is excellent. There is a choice of cheese: American cheese, Cheez Whiz, and Provolene, and we went for the Cheez Whiz which is the recommended one. The sliced ribeye is tender, and the homemade roll is beautifully fluffy, crisp at the surface, and is very slightly sweet to balance the savoriness of the cheese. There are only two choices for burgers, Philly Shack burger ($17.50) or the chicken burger ($14). We got the Philly Shack burger, which consists of 170g of beef, American cheese, bacon, homemade BBQ sauce, among other ingredients. The burger is different from burgers from its previous incarnation, The Butchers Club (TBC). TBC’s burgers were massive, masculine, and wild, but this one plays by the rules, and as a result, it’s boring. Although the patty is dry, I like how they don’t mince the beef too finely so there are still chucks for texture. Not bad, but it is not something I’d return to eat. There are wings (6pc $8.50, 12 pc $14) and a damn spicy mary ($15) but we opted for the fully loaded chocolate milkshake ($10), which is chocolate milkshake topped with whipped cream, oreos, chocolates, gummy bears, M&Ms. It is ok, but perhaps the spiked peanut butter jelly milkshake ($13) would make a more interesting choice. To be honest, food-wise, I prefer TBC to Philly Shack because TBC’s burgers had more character. 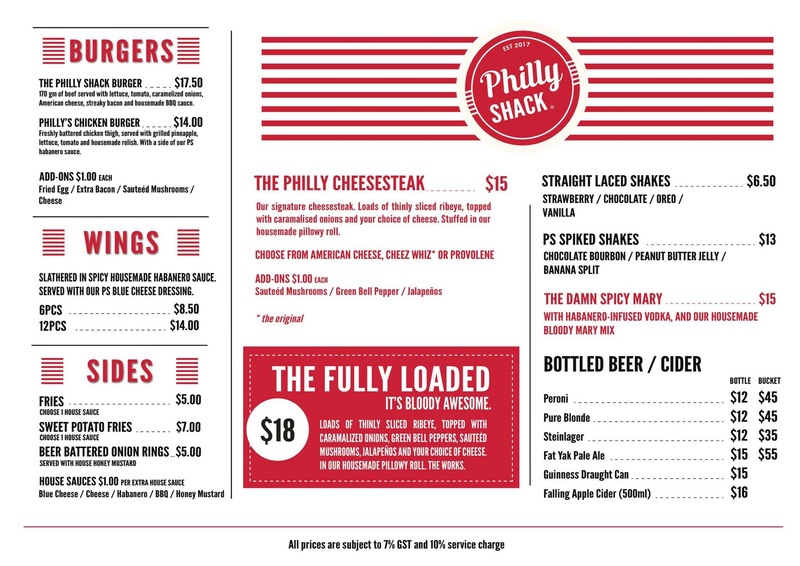 But they have worked on the pricing, and Philly Shack is more affordable. We spent $50 for two persons. Someone is pulling your leg. Botak Jones has been serving excellent Philadelphia Cheesesteak on Balestier Rd for years. Just because you don’t know the truth doesn’t mean you can say what you want. I’ll bet there were others before BJ, in the past also. I really like the way you’ve started posting menus :) Thank you! Yeah. :) I figure it is more convenient for reference. Went to try this place out on 28jun17 and the waiter at the door said they werent open and would be closing for good. He said they were having some problems. Just tried calling their phone no 68370675 today (12 aug) and it was disconnected. You should remove all mention of this place as it is gone for good.